I’m known for my sense of direction. I can visit a place once and later return to it without a map. But this sense failed me when I first moved to Seattle. For the first time, I had to rely on a GPS and the dulcet tones of my devices telling me where to turn. Eventually (and I mean a year later), I learned how to navigate through the city, and now I’m a pro. The GPS got me to where I needed to go when I couldn’t do it myself. But this isn’t about me; it’s about you! You’re on an adventure with Tableau. Perhaps your company chose it as its enterprise analytics platform. Or maybe you began exploring on your own for fun (and who are we kidding—it’s always fun!). Either way, what matters isn’t how you got here, but where you’ll go next with Tableau. It’s a “choose your own adventure” of sorts. You’re the one who gets to pick the path. Perhaps all you need is our free on-demand training videos to help you on your way. Or perhaps you’d prefer having a tool, like the GPS, that could help guide you and correct you as you learn. This tool is our classroom training. Whether you’re a beginner or a Jedi, we have entire courses dedicated to helping you do more with your data. These courses have helped thousands of people learn Tableau much faster than they thought possible. We offer three different levels of courses. Here’s a handy viz to help you determine which course is right for you. Brand new to data analysis? Start by building a strong base. 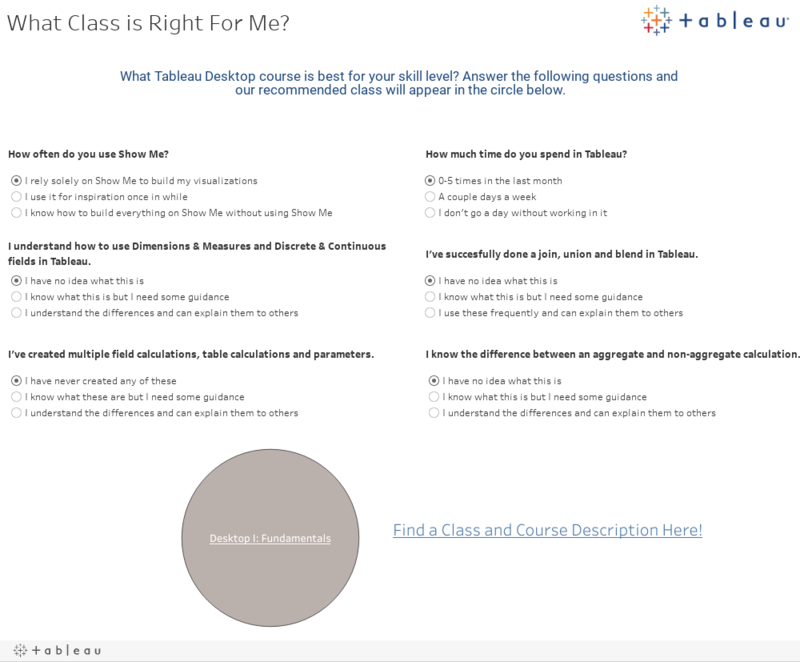 Familiarize yourself with the navigation and defaults of Tableau. Build foundational knowledge in multiple areas of Tableau. Popular questions: What is Tableau? How do I change data types? Connect to data? Where do I drag things? How do I create a calculation? If you’ve ever asked yourself, “How do I use measure names and measure values? What the heck are they? Am I even using these right?” Desktop I is for you. Learn how to work with more complex data integration through joins, cross-database joins, and Unions. Go beyond calculation principles with LODs and parameters. Take your knowledge even further by playing with maps that have nothing to do with geography! Learn the magic that is Measure Names and Measure Values. Popular questions: How do I create logic statements? When do I use aggregated versus non-aggregated calculations? How can I create interactivity? Where are things happening? This brand-new course is truly pushing the limits. We tested this out on some of the smartest people we know to make sure this is truly an advanced experience. Go deeper into LODs, table calculations, and calculations. Know when they intersect and when they don’t. Understand when to use one and not another. Then pull together all of your knowledge to solve problems in real-world scenarios. This course isn’t for the faint of heart! It will require advanced knowledge of Tableau. Now it’s up to you, intrepid explorer! You get to choose where you go next and which class you take. We offer our classes around the world, both in-person and virtually. We’ll also hold one-day classes at TC16 in Austin next month. Sign up here to secure your spot. And tell us in the comments below what you’re looking to gain from the class. We are invested in your journey, and we want to help you every step of the way!